1 - A maximum performance pneumatic system ! 1 — The seeds fall into the air-flow. 2— The seeds are pushed by the air-flow, but some types of seed are blown back by the turbulence. So, not all types of seeds can be sown ! Thanks to its original pneumatic system that reduces blowback phenomena and optimizes seed transport, the SEPEBA distributor is as efficient with light seeds (ray-grass) as with heavy ones (wheat). Its easily interchangeable rotors allow the SEPEBA seeder to accurately spread either colza at 5 kg/ha or barley at 120kg/ha*, or even more depending on the width of seeding. The SEPEBA plus-point: We can manufacture tailormade rotors for you, to meet your specific needs. 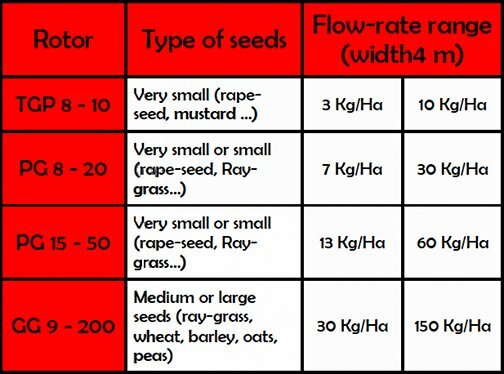 * These values are given for information purposes and vary depending on the width of the seed beds and the sowing set-up being used (slope of seed-tubes in particular). Example flow-rate table for sowing on 4 m wide at 10 Km/h. These figures are given for information purposes; they vary depending on the size of the seed, its shape, sowing conditions (slopes in particular). Certain high flow-rates for large seeds require the use of fans or air-turbines of higher volume than the standard fan. A height-adjustable brush seal regulates the filling of the rotor to give perfect regularity. Capable of sowing a very wide range of seeds, the SEPEBA plant cover distributor has been designed to provide either very high or very low doses thanks to the design of its blower, its various rotors and its adjustment system. Definitely an essential factor in the success of your sowing ! We’ve chosen a flow-rate adjustment system using a gearbox with interchangeable sprockets, for its simplicity, sturdiness and high reliability. A spring tension adjuster allows the sprockets to be changed very quickly (approx 2 min). The choice of sprocket is easy thanks to the adjustment notice which gives the combination of sprockets corresponding to the required dose. For electrically powered models, an electronical adjustable speed control exists as an option. It enables to get a wider range of flow-rates and to adjust the dosage from the driving post of the tractor. It is as well possible to get a FPS (flow-rate proportional to ground speed) version of this electronical adjustable speed control. With the sprocket adjustment, an electrical drive system with a start/stop box is provided as standard. Very easy to mount and to move from one soil-working machine to another, this economical solution suits most uses, where the tractor speed can easily be maintained constant. To get a flow-rate proportional to ground-speed, an independent wheel is available, with transmission by universal block or cable depending on the type of machine the distributor is mounted on. This solution is suitable wherever the conditions of use involve a variable ground-speed (steep slopes, very heterogeneous soils…). 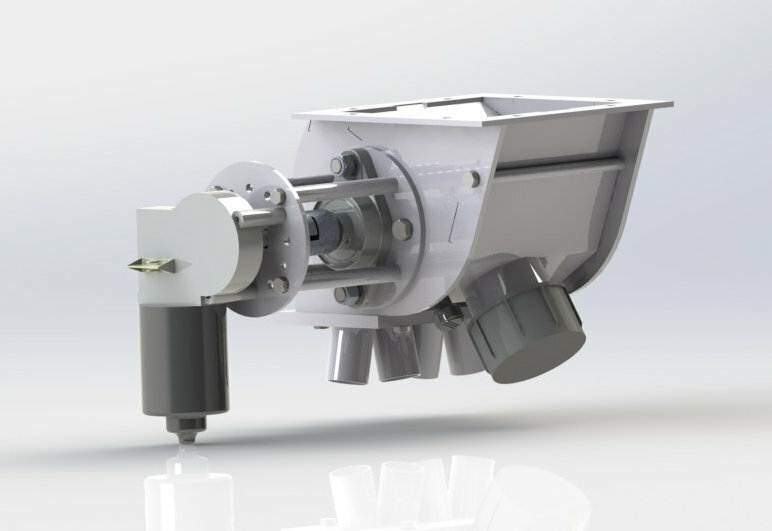 We designed the SEPEBA distributor with you in mind: we wanted it to be practical and reliable. Adjustment container: A container fitted on the machine allows you to carry out your tests for the distributor settings.